Databricks released this image in December 2017. It was declared Long Term Support (LTS) in January 2018. The following release notes provide information about Databricks Runtime 3.5, powered by Apache Spark. Databricks Runtime 3.5 includes a number of performance and usability enhancements to Databricks Delta, which is in private preview. See Introduction to Databricks Delta. Added repartitionByRange to Dataset API. 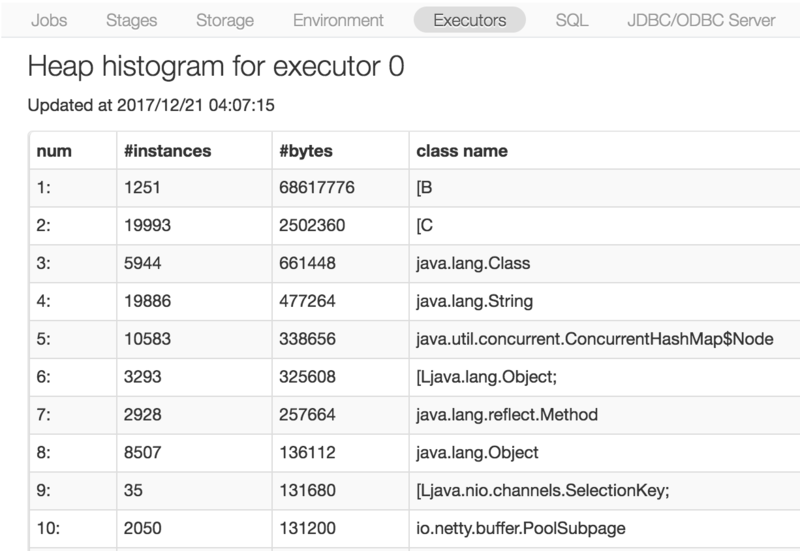 Added “Heap Histogram” to Spark UI’s Executors page for driver and executors. A heap histogram shows the total size and instance count for each class in the heap, which allows uses to easily understand how different kinds of classes consume heap memory of a driver or an executor. R is available on Serverless pools as a beta feature. Contact your Databricks account representative to be included in the beta program. Upgraded Python library setuptools from 36.6.0 to 38.2.3. Upgraded several pre-installed R libraries. Please refer to Pre-installed R Libraries for details. [SPARK-22721] BytesToBytesMap peak memory not updated. [SPARK-22637][SQL] Only refresh a logical plan once. [SPARK-22273][SQL] Fix key/value schema field names in HashMapGenerators. [SPARK-26665][CORE] Fix a bug that can cause BlockTransferService.fetchBlockSync to hang forever. Fixed an issue that Spark low level network protocol may be broken when sending large RPC error messages with encryption enabled (in HIPAA-Compliant Deployment) or when spark.network.crypto.enabled is set to true). Only ignore corrupt files after one or more retries when spark.sql.files.ignoreCorruptFiles or spark.sql.files.ignoreMissingFiles flag is enabled. Fixed an issue affecting certain self union queries. Improved error handling in Delta. Fixed a bug affecting certain aggregations in streaming queries. Improved the efficiency of handling streams that may take a long time to stop. Fixed a bug affecting Python autocomplete. Fixed a bug affecting certain queries using Python UDFs and window functions. Fixed a bug affecting the use of UDFs on a cluster with table access control enabled. Fixed a bug affecting the manipulation of tables stored in Azure Blob Storage. Fixed aggregation after dropDuplicates on empty DataFrame.